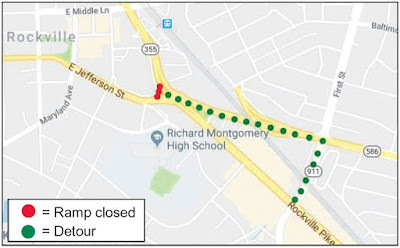 Update: April 4, 2019: The City of Rockville has issued a correction stating that the actual closure is of the southbound ramp from MD 355 to Veirs Mill Road. The detour is to take 355 to First Street, and then make a right onto eastbound Veirs Mill. 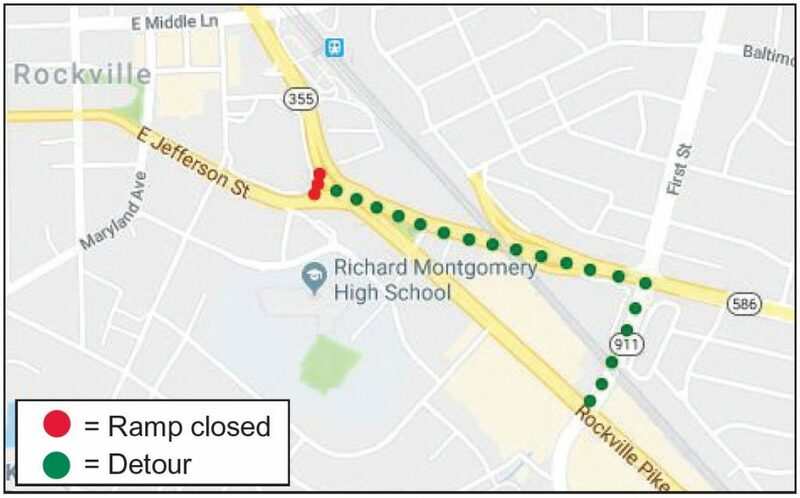 Starting tomorrow, April 2, 2019, the southbound ramp from Rockville Pike (MD 355) to E. Jefferson Street (MD 28) will close for several weeks. The Maryland State Highway Administration will be resurfacing the ramp and upgrading safety features during the closure. Drivers are advised by the SHA to use a detour of Veirs Mill Road to First Street to Rockville Pike to get around the closure. During the project, there will also be intermittent closures of the northbound right lane of MD 355 near Church Street, and mid-day and overnight temporary closures of single lanes of MD 355 between MD 28 and Mannakee Street for resurfacing and concrete work. Those closures will continue through the fall, while the ramp to MD 28 should reopen in mid-spring. That detour makes no sense. The ramp being closed and the detour route do not intersect, nor does the detour serve the purpose of the ramp. This is very misleading. Agreed. Wouldn't one take a right at the light in front of Rockville Metro (before you hit the closed ramp), then take the left onto Monroe to get to Jefferson?